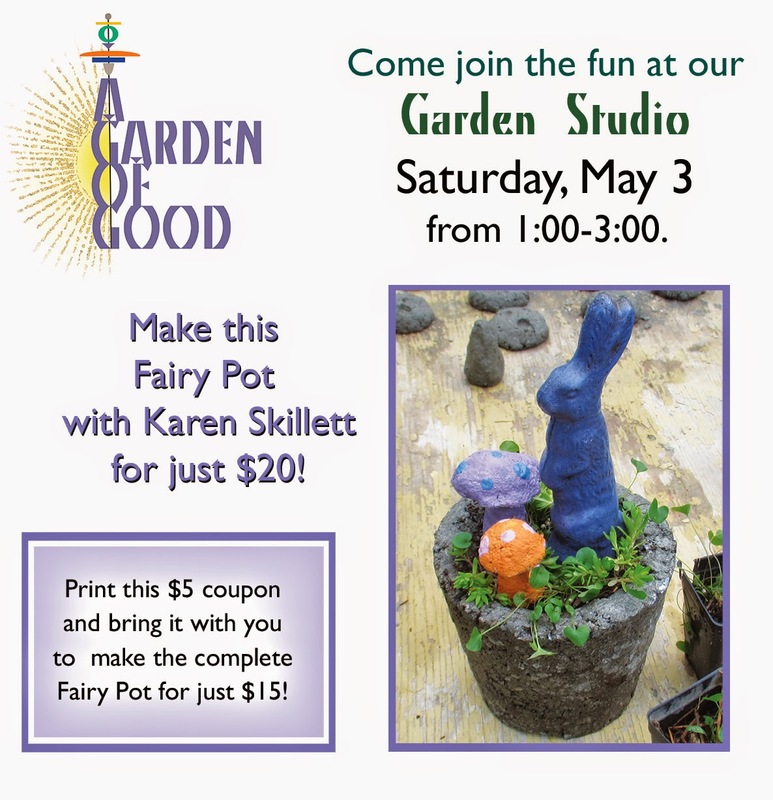 This Saturday at A GARDEN OF GOOD! “I have observed all sorts of birds in my yard, but I have always had a particular fondness for the smallest ones, including the wrens. Most common is the house wren, and this is my favorite encounter with one of them. 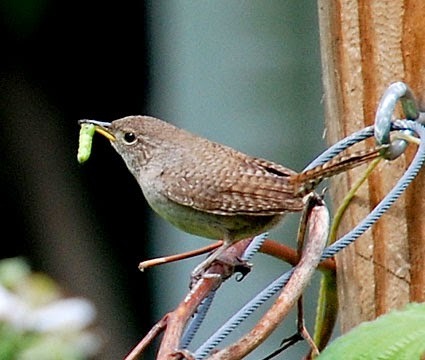 “While I was speaking with a customer at From the Summer’s Garden, she asked me if wrens were too shy to nest near her deck. Before I could elaborate, a wren landed on my bird house display five feet away in the midst of a crowd, and proceeded to investigate all the houses in the top row. “An easy way to start out attracting birds is to put up a bird feeder. We'll help you choose feeders and foods that appeal to the birds you want to attract, plus we'll tell you where to put your feeder and how to maintain it. Nest boxes offer many birds a place to raise their young, especially where natural cavities are at a premium. Our nest box section describes the features of a good nest box, where to place it, and how to avoid predators. Our nesting section also lists some nesting materials you can offer that will help a wide variety of species. 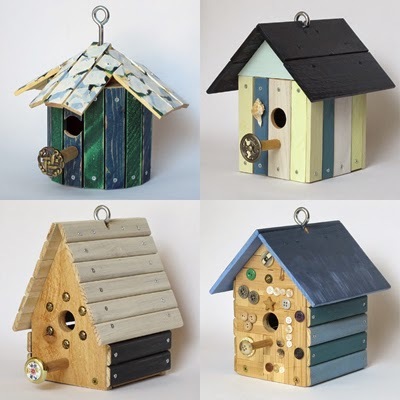 Syd has a large selection of custom wren houses at A GARDEN OF GOOD. 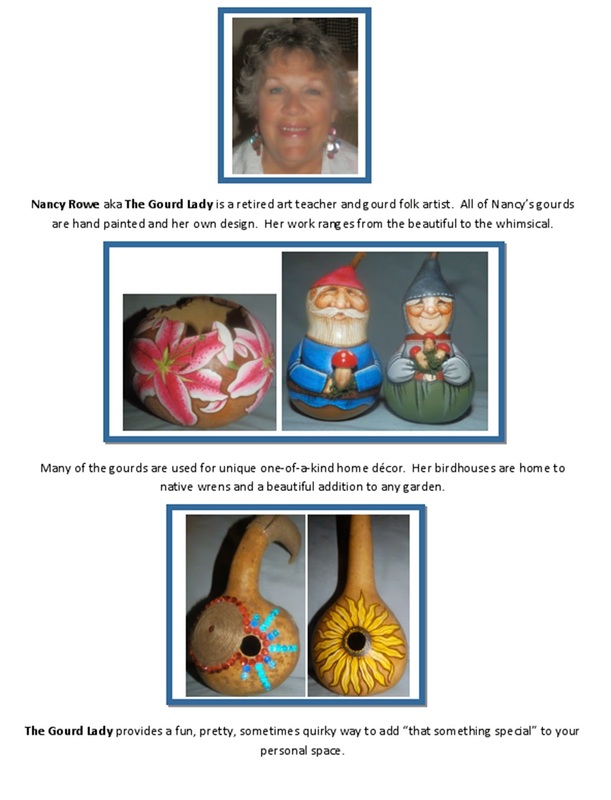 Nancy Rowe, The Gourd Lady, another of our artists, has created unique birdhouses for wrens from birdhouse gourds! 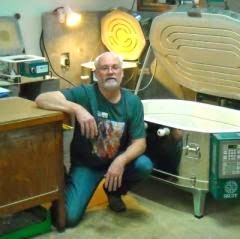 John has been firing glass in electric kilns for about 7 years now to create a variety of fused glass items. His business CainFusions consists of John, his wife Anita, & their good friend Jim Rice. 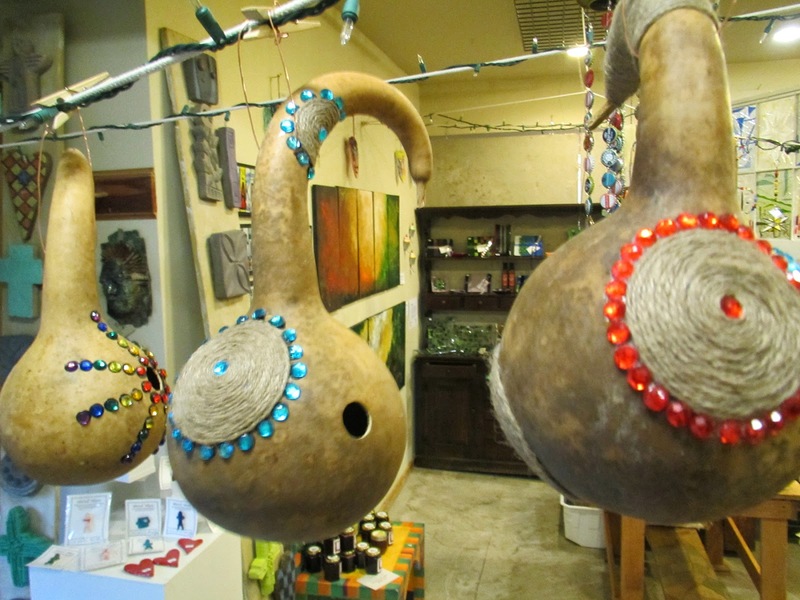 A wide array of dishware is the main emphasis, although they also design sun catchers, art pieces, & other whimsical items whenever the mood strikes. 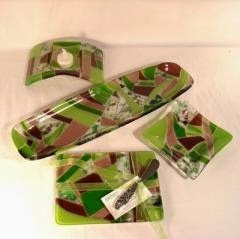 All of the bowls, trays, & platters are dishwasher safe. 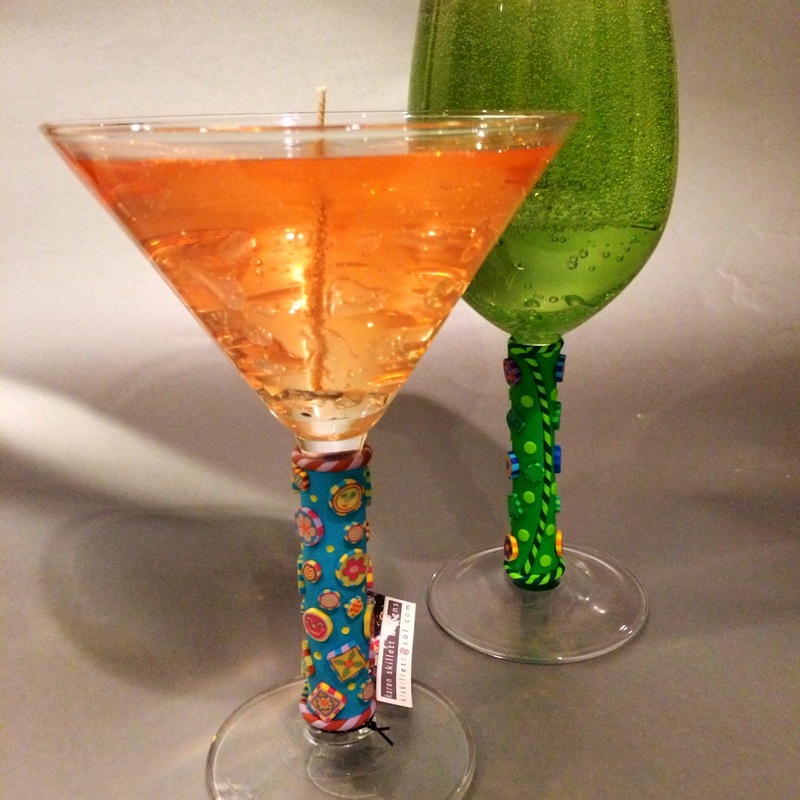 They provide a splash of color for your décor & brighten up any entertainment presentation. This year we are showcasing coordinated collections. If something catches your eye, and you need a companion piece or two, they’d be more than happy to work with you on a special order! 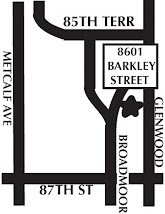 All pieces are designed, assembled, fired, & finished in their home glass studio in Lenexa. We were awarded the backyard patio at the 2014 Designer's Showhouse which automatically meant pretty large containers would be the foundation of our design solution. Our new totem series really helped to kick the container thing up several notches. When you visit the showhouse this year, be sure to check out these containers on the pedestals around the back patio. Here's a fun new sculpture concept for your garden. Once you have your forms selected, you choose your colors from our 2014 color palette. Here are a few examples of how this works. 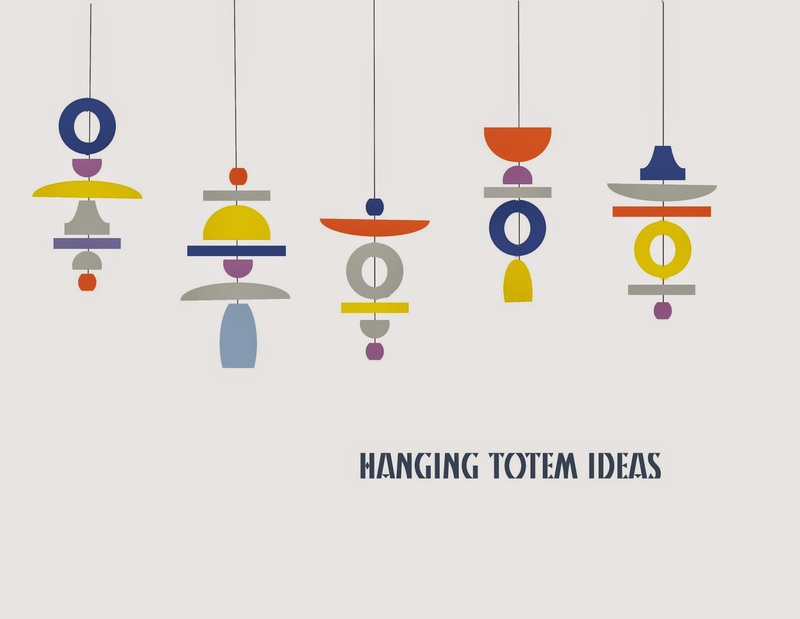 You can also create a hanging version which is pretty cool hanging from a pergola or a large tree branch. 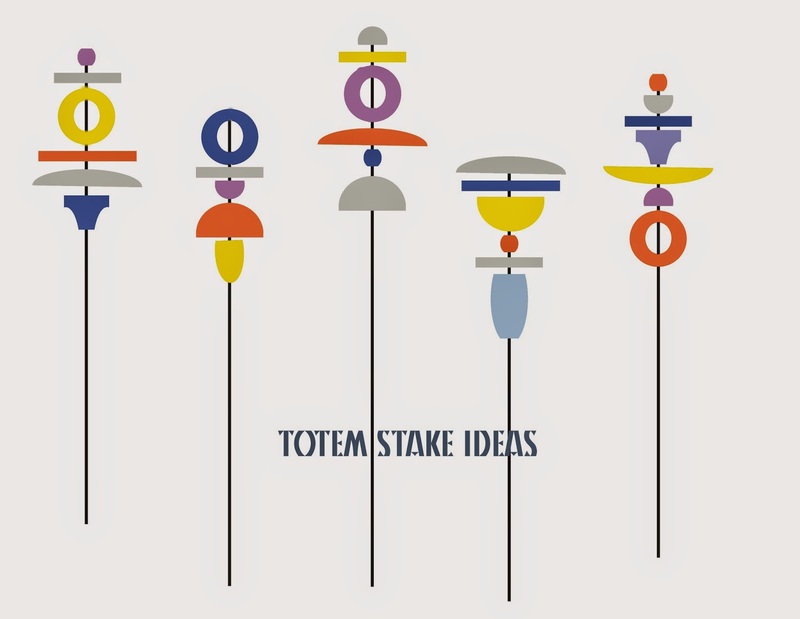 Come build your totem at A GARDEN OF GOOD! 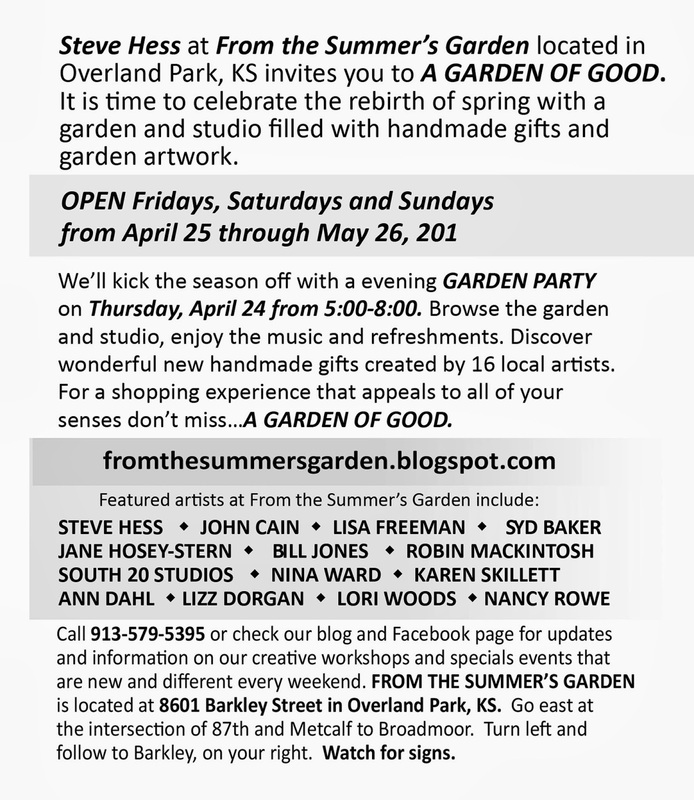 Join us Thursday, April 24 from 5:00-8:00 pm for our opening night garden party at From the Summer's Garden. There'll be tasty refreshments and live music provided by Bob Morrison. He plays accoustic guitar and mandolin. Mary Rimman from Rimman Liquor will sample some new local wines and Nina Ward will give you a taste of her latest KC Gourmet products. Just wait until you see the awesome fresh-baked cookies Loretta from Boulevard Bakery has made this spring-talk about good! Something new this year will be the ongoing series of art workshops held during each of Saturday Special Events during A Garden of Good. 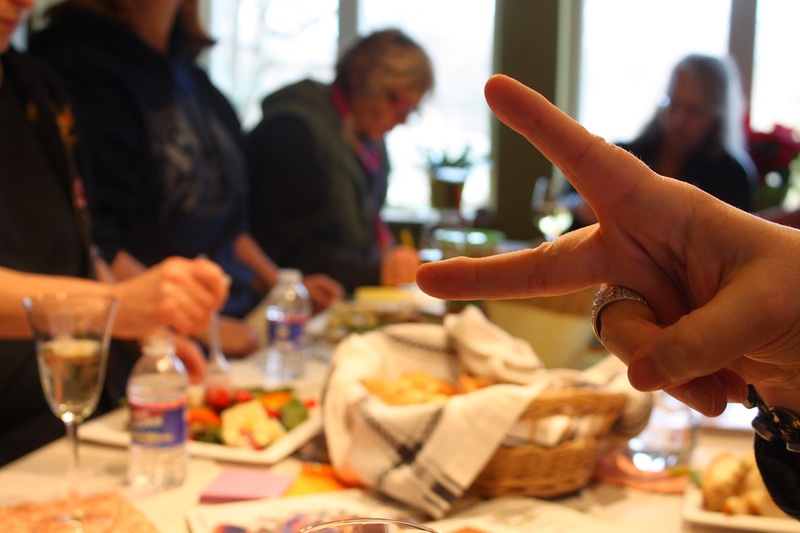 This is a working studio, a perfect place for people to have fun being creative. For opening night, we have four different projects led by artists in the studio upstairs. 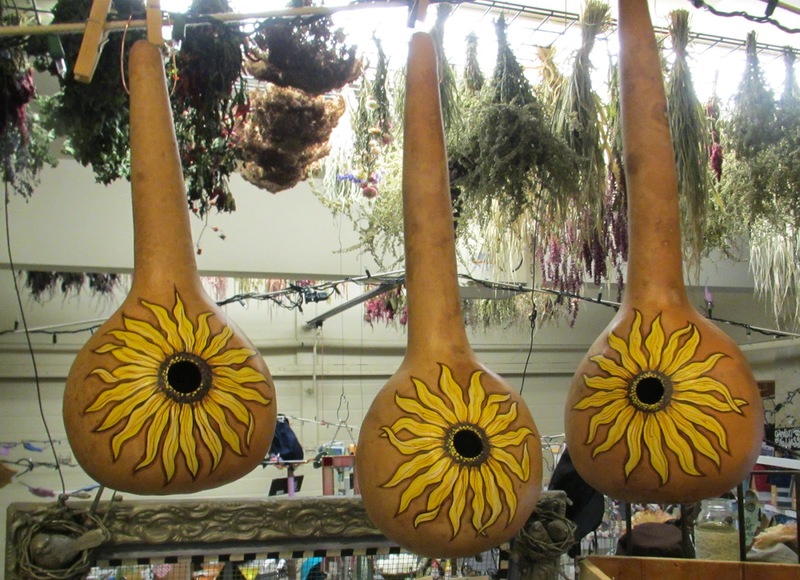 Diva Jane-Hosey-Stern will be showing you how to make beaded glass vases for the floweres coming into bloom in your garden. 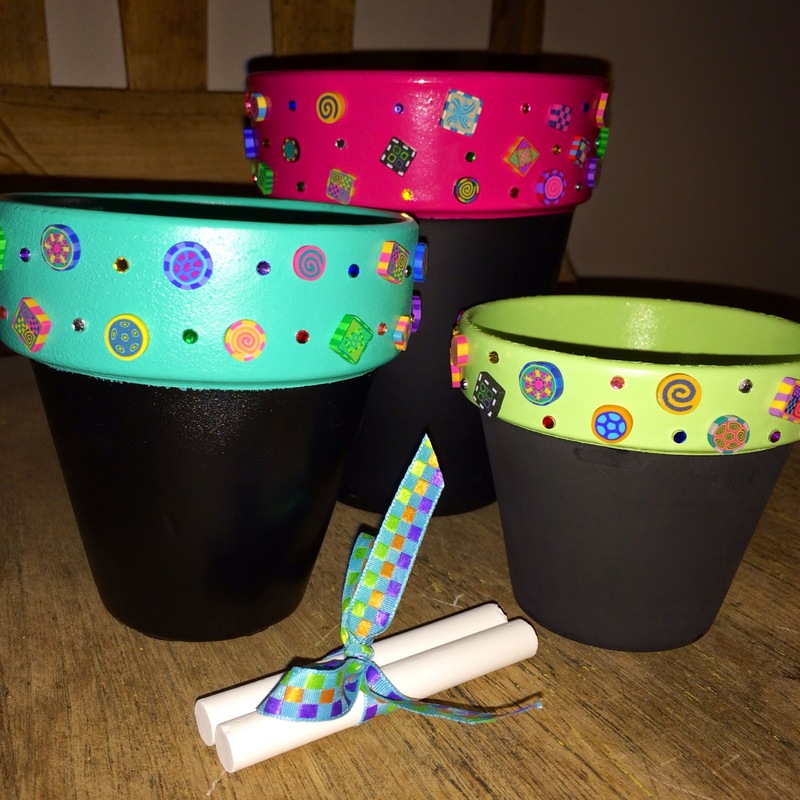 Perhaps you'd rather paint a chalk-ware figure to use as a decorative pick in one of your flower pots with Karen Skillett or learn how to create beautiful handmade paper flowers with Sue Bower and Steve. 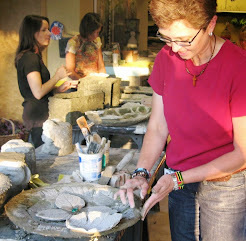 Ann Dahl will be teaching you how to make seed balls that will grow flowers when you toss them into the garden! What's really COOL is that at the garden party, all four of these actvities take only 15-20 minutes and are free to all! 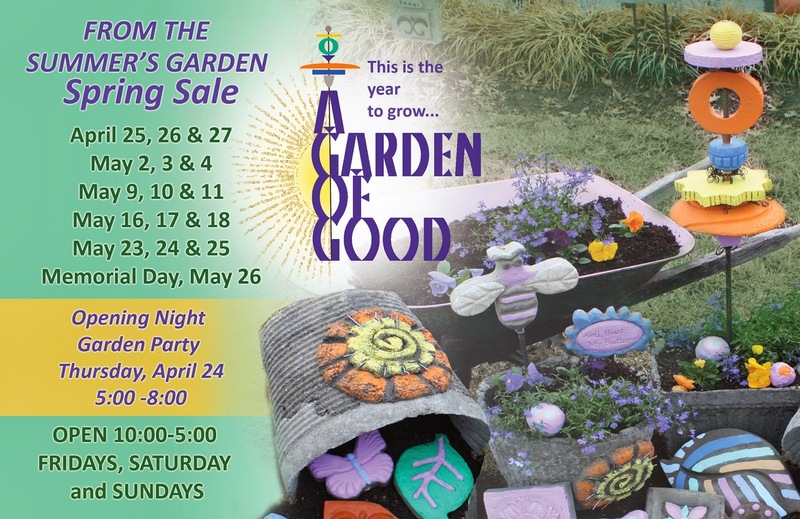 Come celebrate spring at A Garden of Good! A GARDEN OF GOOD...Opens Thursday, April 24th! The bird houses in my yard have been installed two different ways. The easiest is to hang from the bottom of a tree limb. I have used a pre-measured length of insulated copper wire poked through the hanger halfway, then wrapped around the limb and twisted securely at the top. Here is a link for securing a pole in the ground using concrete. Be sure to get a threaded pole if you are using a floor flange, or choose from other pole-top mounting hardware options of your choice. There are quite a few available. 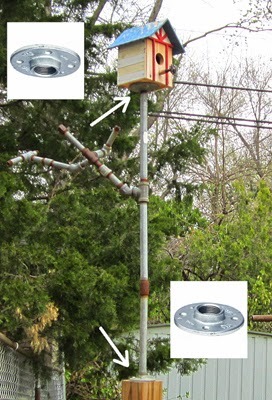 One workable alternate pole mounted house is to attach one of the above-mentioned floor flanges to the bottom of your birdhouse, and attach a second one to the top of a fence post or deck post, connect them by screwing in a short section of steel pipe threaded on each end. 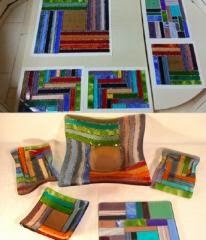 Karen Skillett has been busy since the holiday show, putting a new "spin" on some of her most popular formats! 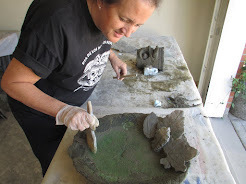 Her gnomes and chalkware are back -- in concrete. 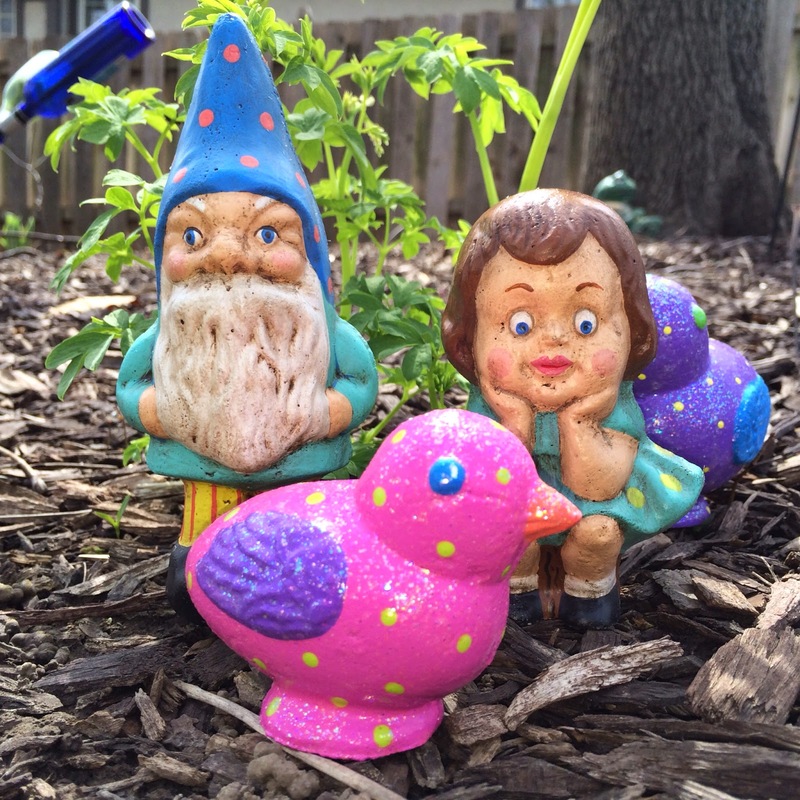 The will make great additions to Steve's fairy garden containers! 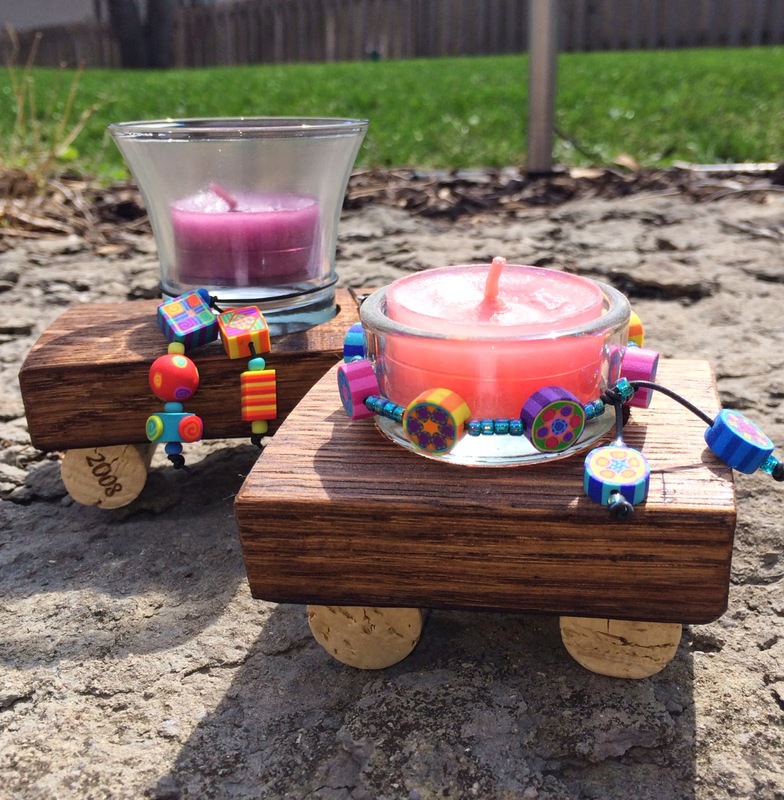 Karen has joined Lisa Freeman in her quest to use found items, and her wine barrel wood has been adorned with corks and Karen's own beads. And this is just the start of all the new formats this spring! Many times when you see something empty and out of context it is hard to visualize how you can make it into a dramatic focal point or something really useful. Here are three simple ways that will kick this Hypertufa Hanging Basket up a couple notches! 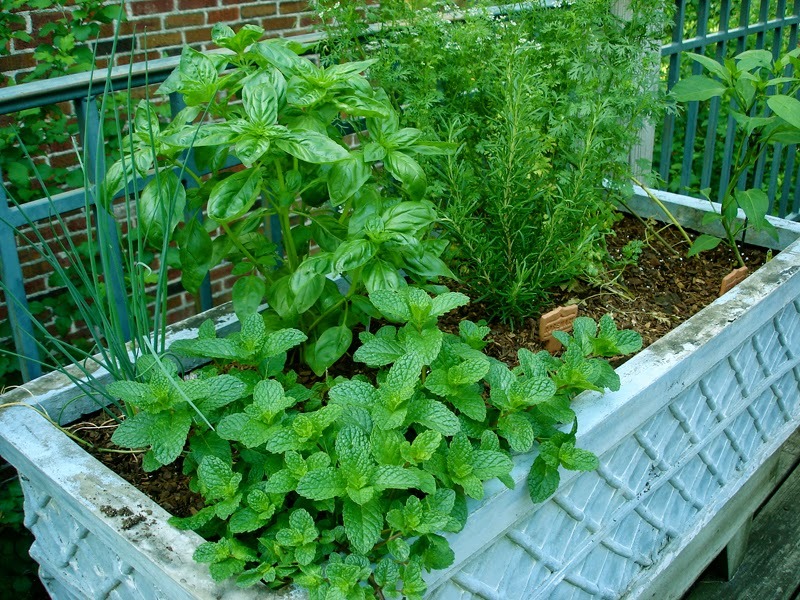 1.Fill with potting soil and plant up with one or two varieties of colorful annuals. I used simple mini-orchid petunias because they are so easy to maintain. A spiller would add a nice accent too, something like yellowgreen Creeping Jenny. 2. When I see a dandelion growing anywhere in my yard, it must come out immediately! 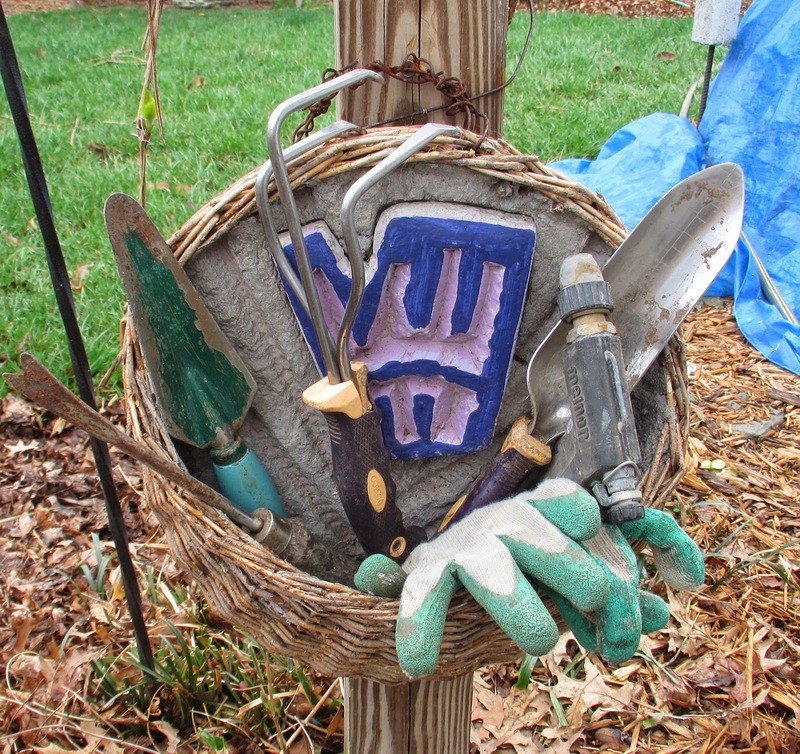 It's handy having garden tools stashed in key spots throughout the garden so I can readily dispatch the dandelions and other "unwantables" easily. 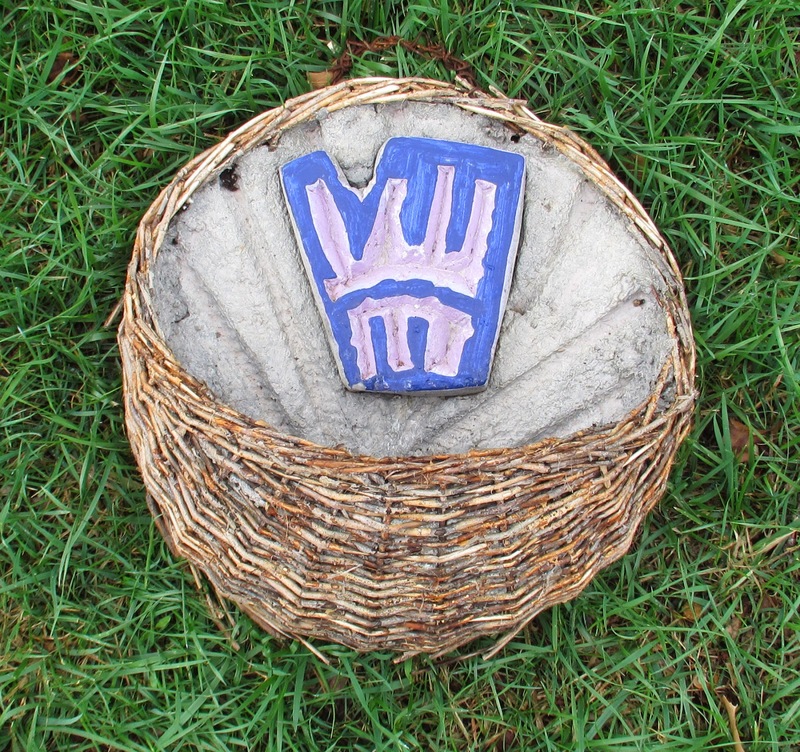 Here the Tufa Basket serves as a nice tool caddy and the drainage hole keeps rainwater drained away. 3. When you want to dress up the place a bit, the Hanging Basket can serve as an effective focal point. 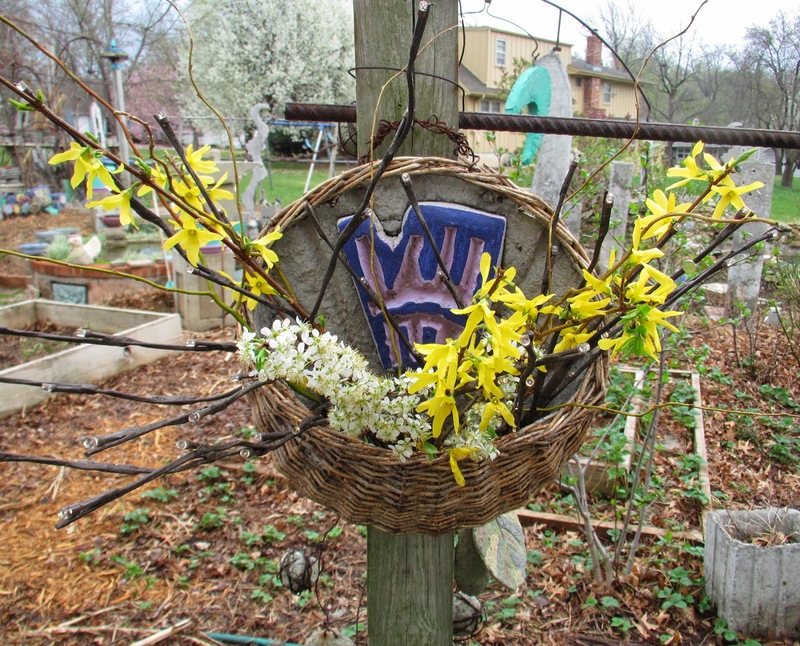 For our upcoming Garden Party opening event on Thursday, April 24 from 5:00-8:00, we'll use several of these baskets filled with fresh-cut twigs and flowers. They are kept fresh by a concealed jar of water in the basket. For a nice added touch, we'll add battery powered twig lights which will become more apparent once the evening darkens. 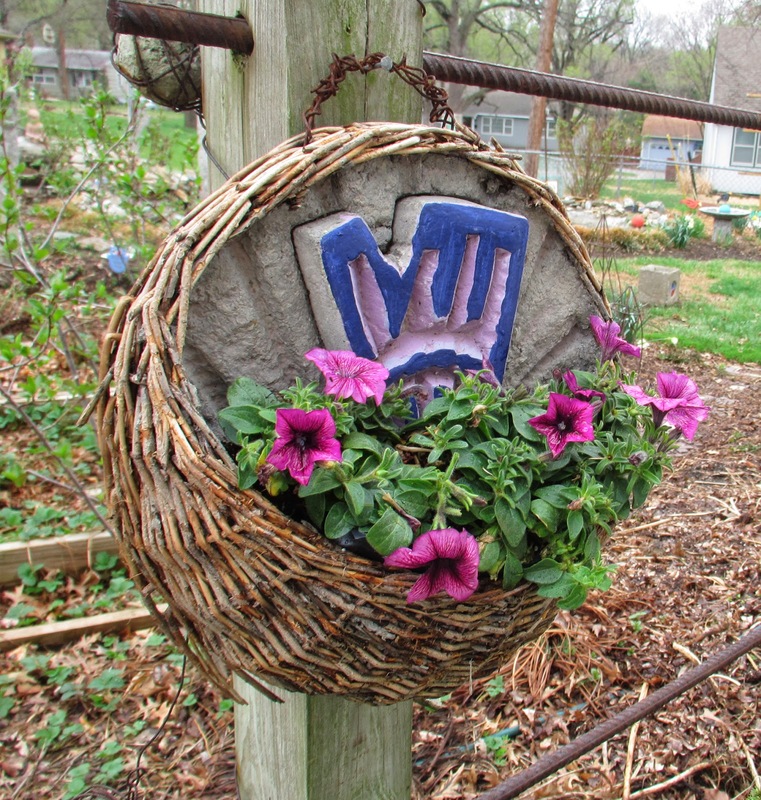 This Hypertufa Hanging Basket can help you create your own Garden of Good. 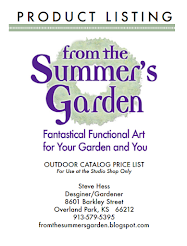 feature their gourmet foods at From the Summer's Garden sales events. They have selected a few favorite products to share with you. Starting off are the Cheese Dips. Unlike most dips you buy which require you to gather additional ingredients to complete your dip, Their's is ready to go. 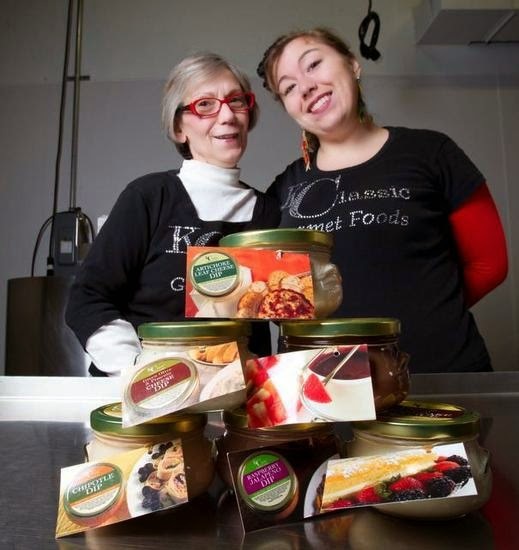 KC Classic Dips are convenient, rich in flavor, great for parties or great to give as a gifts. There’s a favorite flavor for everyone. Chipotle, Raspberry Jalapeno, Green Olive and Pimeto and Artichoke and Spinach. ** Chipotle - a great spread for a Burrito Wrap or a Sandwich. Add ham, chicken or pork, some chopped black olives or shredded lettuce. Heat or eat at room temperature. This dip is also wonderful used as a basting sauce on grilled cobs of corn. ** Raspberry Jalapeno - great as a bagel spread, cracker or chip dip. Mix the Raspberry Jalapeno dip with a can of rinsed and well drained black beans, and a ½ cup of chopped spring onions. Spread mixture out on a 12” diameter pan. Layer with shredded lettuce and then a layer of shredded Cheddar Cheese. ** Green Olive and Pimento -Nina's favorite. Chips, Crackers or Celery. Great bread dip, or a spread for a sandwich. ** Artichoke and Spinach Dip with Chips and Crackers as a hot dip. Mix a jar of the Artichoke and Spinach with a drained can of Chicken. Spread into a dish, sprinkle with some bacon bits. Bake for a 15 min or golden brown at 350 and serve hot. 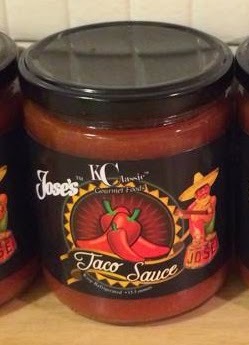 ** Jose’s Taco Sauce, a legend of the Jose’s Mexican Restaurant in the 70’s and 80’s, has returned! Jose’s is versatile and makes a wondeful sauce for chips, nachos or enchiladas. 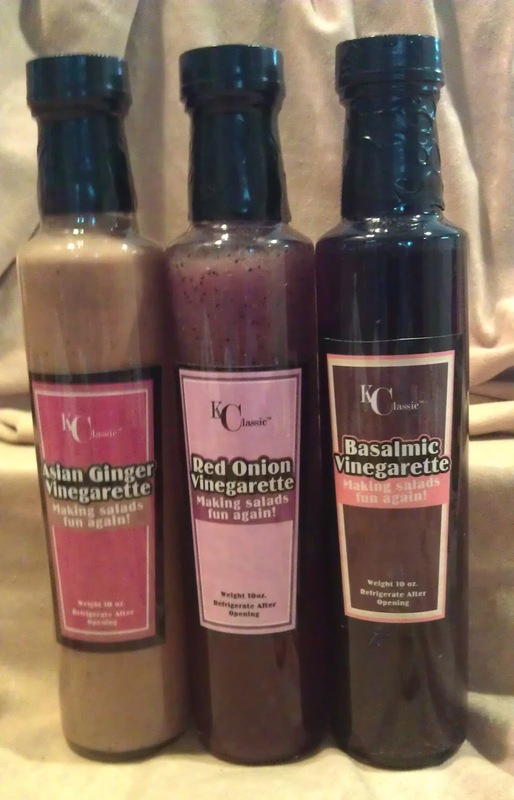 These last three feature ideas using KC Gourmet's new salad dressings. ** Red Onion - great summer salad dressing. Romaine and Red leaf lettuce, add slices of avocados, pineapple and mandarin chuncks and walnut pieces. ** Balsamic - Very good with Romaine lettuce. ** Asian - Marinade your chicken breast and grill to create a great summer entre.